MUMBAI: TellyChakkar exclusively reported about Naagin 3 leads Pearl V Puri, Anita Hassanandani, Surbhi Jyoti, Shakti’s actress Kamya Panjabi, and Bepannah lead Harshad Chopda featuring tonight in Bigg Boss Weekend Ka Vaar (read here: Harshad Chopda, Kamya Panjabi, and Naagin 3 leads in Bigg Boss Weekend Ka Vaar). We have learnt that the handsome Shivin Narang, who is currently playing the lead in Internet Wala Love, also joined the gang to enter the Bigg Boss house. According to our sources, the actors dance with host Salman Khan and are later sent inside the house to entertain the contestants. Bigg Boss asks the actors to imitate the contestants. 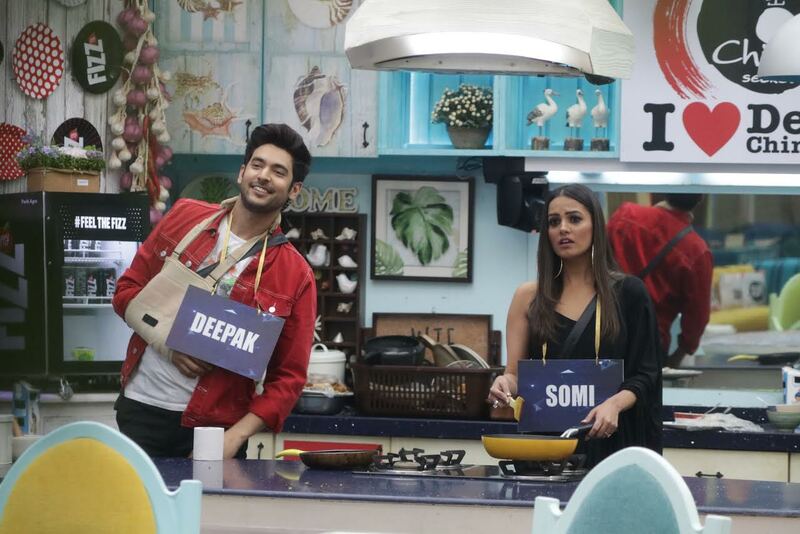 Kamya imitates Megha, Surbhi mimics Dipika, Pearl copies Sreesanth, Harshad imitates Karanvir, Shivin is seen as Deepak, and Anita acts like Somi. Have a look these pictures of the actors having a gala time in the house!